Over the course of sixty years, world powers have detonated nuclear devices yielding over 500 megatons, more than 30,000 times the destructive force that devastated Hiroshima. Take a walk through the history of global nuclear testing, from 1945-2005, and watch as the world’s great powers rattle thermonuclear sabres at each other. Above: the fully scaleable interface features a wide range of information display, animation, and more. From the United States’ atmospheric testing in the South Pacific to the Soviet Union’s still-unprecedented 50 megaton “Tsar Bomba” in 1961, to the entrance of China, Pakistan, India, and others to the nuclear arms race, the sheer scale of 60 years of nuclear testing the world over is made visible over an interactive timeline spanning minutes. 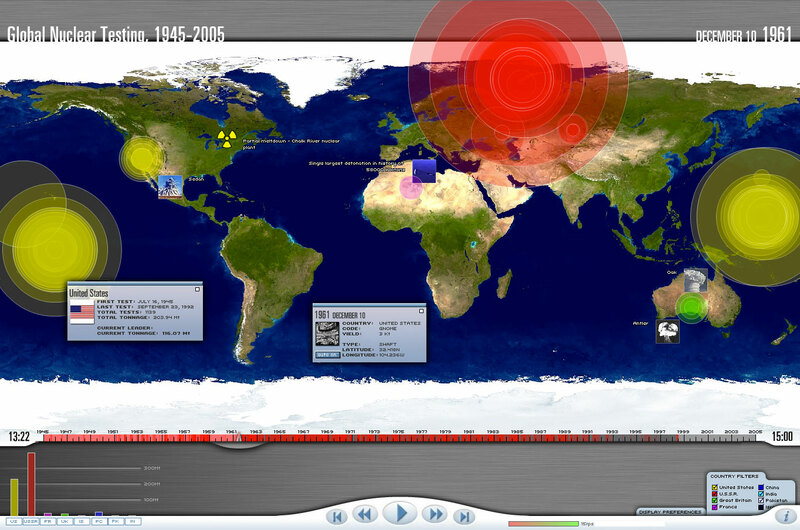 With a fully scaleable interface, Global Nuclear Testing, 1945-2005, is perfect for large displays and classroom projection. Click on any individual detonation for detailed information, including its codename, yield, type, and photograph if there’s one available. Live graphs chart the rising megatonnage by country, up to a record maximum of almost 350 megatons detonated by the Soviet Union, who ended their active tests in 1990. Click here to launch Global Nuclear Testing, 1945-2005, in a new window. This entry was posted on Thursday, October 27th, 2011 at 12:37 pm. It is filed under Visual Application Development and tagged with ActionScript 1.0, Adobe Flash MX. You can follow any responses to this entry through the RSS 2.0 feed.